On a recent trip to Los Angeles I decided to visit the Hollywood area. I did not know about the Haunted Mansion Hollywood exhibit. I saw an ad for it and decided it may be worth checking it out. We went the next day to the El Capitan Theatre and after watching the movie again we were ushered outside to an area behind the theatre. A huge structure was erected to house the interactive area. The façade was part of the set from the movie and looked great! I was already impressed! Could it have been more than I imagined it would be? The answer was a definite yes! Upon entering I immediately grabbed for my camera and starting taking pictures. I wasn't even sure whether or not you could take photos but I was so excited with what I saw it was just an uncontrollable action. Madame Leota in her crystal ball greeted us perched on top of the horse drawn hearse from the film. This was done with video projection, basically the same way they do in the Mansion at the parks, but rear projected from inside the hearse. As far as your eyes could see were displays of sets, props, and special effects from the film. If you were at all into the Haunted Mansion film or have been a fan of the Disney ride - this had to be the ultimate experience. Whether or not you liked the movie you have to agree the sets were outrageous! 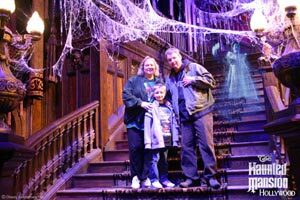 John Myhre, the Academy award winning production designer, certainly took us to the ultimate haunted house with his rich detail of the scenery and sets of the inside of the mansion. Here it was in all its glory. The library set, the music room, the catacombs, Master Gracey's tomb, the singing busts in the graveyard, and the grand staircase. I wasn't quite sure where to start. In each of these areas you could have your picture taken and emailed to you. When you downloaded them back home they created a scrapbook complete with information about the set and its details. They even had a ghost show up in the picture -that was a great idea and worked well to bring you back to the movie's website. On exhibit too was the Rick Baker sculptures for the graveyard ghosts which we all would have liked to seen more of in the movie. After watching the video I realized that I really liked the idea of the William Tell ghosts. You saw them in the movie; it was the gag where the ghost shoots the bow and arrow and misses the apple on the other ghost's head, very funny, I don't think a lot people got that. Here too was a chance to see the zombie makeups and costumes up close. Behind the scenes footage could be seen at each area that included interviews with the talents that provided us with all the ghostly goings-on. A 15-minute show was about to start and we all went into a small theatre area. A live host introduced video of more behind the scenes interviews. Although some of the footage overlapped with the information at the exhibits the host did a formidable job in campy haunted humor. There were hundreds of props on display including those cool doorknockers from the film and models of the inside and outside of the mansion made in foam core. Tyler my son who is seven, found his favorite spot. Upon entering the tomb of Master Gracey and descending the steps there was an interactive playground that was all lit in backlight. Games for the kids, including a form of basketball played in black light, were enhanced by having some of the openings, that you would throw a ball into, just painted black. Or how about playing ping-pong on a checkered table top only to find the ball disappears into one of the black squares! Very cool effects and the kids loved it. Children also could create a storyboard and other neat activities around the exhibits. The singing busts were on display. Two of them were the ones not used in the movie, which included Marc Davis, and Blaine Gibson, two Disney Imagineers that were extremely influential and contributed so many of the ideas for the original attraction in 1969. The busts were set in a graveyard with a few pop up ghosts and some nice crypts. On the way out, in true Disney tradition, there was a small shop that sold shirts and some buttons, and a couple of magic tricks. Of course I bought everything they had. We spent a total of three hours there and I must say I could have spent more time. It was a nice surprise to find that Disney did put a lot of effort in creating this interactive attraction, especially for fans of the Haunted Mansion. If you want to know more I highly suggest you pick up the book, "The Haunted Mansion; From the Magic Kingdom to The Movies" by Jason Surell. It's a great book with a ton of pictures from both the movie and the attraction.